Today we’d like to introduce you to Paul Wackym. We started Wackym’s Kitchen in the fall of 2008 when the economy tanked, and I followed my urge to change my career path. I abandoned the security of corporate employment in favor of a more personal endeavor based on my love of cooking and entertaining. Armed with a diverse background in fashion and design and bolstered by lots of encouragement at home, I started baking batches of my original cookie recipes in the rented kitchen space of a friend. In retrospect, it amazes me how it all started, with me showing up week after week, making very small batches and then selling my cookies at the Dallas Farmers Market. I stood on the docks at the market every Saturday and Sunday throughout the freezing winter and blazingly hot summer and steadily built a loyal following. I had confidence that if I made a great product, consistently showed up, and let the product speak for itself, then customers would follow. After nine-plus years of baking and sharing cookies, I still go to local markets every week that I am in town in order to sample and share sweetness. Staying in touch with the local food movement is paramount to the success of Wackym’s Kitchen. Constantly being in front of our core customers by introducing new products and packaging and then receiving direct feedback has helped to build a larger customer base that has fortunately continued to grow ever since we started. Luckily, every day is a new day. In starting and growing a business, you make mistakes and stuff happens. Each morning a new day begins, and you can hit the pavement hard to do what you can to conquer the day, the week, the world. The road to success (and to market) is paved with potholes, but my partner pushes and challenges me to constantly “figure it out”, which we always do. Our daily challenge is to press on and create the handbook we wish we had been given when we started. Persistence is paramount. A buyer who approached me at the farmers market twice told me to call him about his stores carrying our cookies. After leaving a year of unreturned voice-mail messages, I called the main number and when Rex Howell-Smith, the business development manager for H-E-B’s Central Market, graciously took my call, he set a meeting with me. The next day he tasted all of our crunchy, all-natural cookies and based on the samples, Rex selected six varieties for Central Market. Six months after that first meeting, Wackym’s Kitchen launched not just into one local store, but all nine Central Market locations throughout the state. Based on Rex’s advice, we made and packed hundreds of the six varieties into little four-packs tied with a ribbon, and I drove across the state to visit all nine of their stores, wearing one of my signature hats, happily giving cookies to all of the grocery employees. As the staff opened and ate their samples, I encouraged sharing amongst all of the other store team members. Soon after, I once again I visited every store to sample our cookies and to meet as many customers as I could. Allowing the product to speak for itself has continued to be the key to our success with small and large customers. You might ask what’s up with all the hats? The first year I started selling Wackym’s Kitchen’s cookies at the Dallas Farmers Market, and when the cold weather hit, I made every effort to stay warm, which included trying different hat options. One of the hats I tried was a Tyrolean hat, a gift from my goddaughters that had never been worn. To perk up the hat, I added some vintage red feathers, and not only did the feathers perk up the hat, they also perked up the conversation with customers. 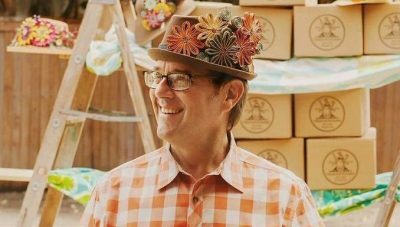 One hat led to another – season after season – and eventually, I became “the cookie guy in a hat” – now a customer expectation, and my delight. I now have over 70 decorated chapeaux – that’s lots of joy. So, as you know, we’re impressed with Wackym’s Kitchen – tell our readers more, for example what you’re most proud of as a company and what sets you apart from others. Wackym’s Kitchen is known for crispy and crunchy, unique, and classic cookie varieties like you would make at home. We bake salty-sweet, spicy-sweet and new-traditional flavors, but with a twist. We work in small batches, making cookies from only real butter, cane sugar, cage-free eggs, and unbleached/unbromated flour. We hand peel citrus, grind fresh ginger, and toast our own nuts. At Wackym’s Kitchen we use only fresh ingredients with no artificial flavorings or preservatives using original artisanal recipes to create a hand-crafted and hand-packed product. Folks enjoy our cute Baker Man logo, our consistent fresh real-food taste, and our offering of 28 varieties throughout the year. We sell at local farmers markets, in specialty grocery stores, and online. Our website helps us spread sweetness nationwide at wackymskitchen.com where we offer lots of gifting options or just cookies to enjoy yourself. Life is sweet. Eat great treats. This sums up our driving force. We work very hard to deliver the best cookie our customer can find. We create surprising and delightful flavors to address every want, need and desire in a treat. We encourage teamwork, hard work and humor in the kitchen because nothing makes a cookie taste better than when it’s made with a hearty laugh. We believe in love; love at first bite. Dallas has a vibrant and exciting local food scene, and we have been lucky to be a part of the passionate movement. When I started 9 years ago, I was not fully aware of the opportunity found right here a home. I came to Dallas in 1986 on the 2-year plan, but ended up staying. In 1991 I bought a house and continued to plant roots, and those roots now run deep and wide. I have worked in several industries here in Dallas, and I have found this big city to be a little town at heart. We have so many great friends in Dallas within the food business as well as friends who support us locally with the majority of our photography, design, printing, and ingredient needs, which makes working here in Dallas just terrific. It is often easy to complain about the seemingly unrelenting heat, especially when loading and unloading trucks (who knew I would ever learn to drive a forklift? ), but no cooler climate could possibly offer all of the love and support we receive from our Dallas friends and colleagues who are so integral to our continued success.